Make the commitment and find your niche, and you, too, will be a part of this amazing wine community. Jennifer started out as an Ag Science major at Cal Poly San Luis Obispo, but after meeting the Aggie of her dreams, husband Herb brought her home to Napa Valley. 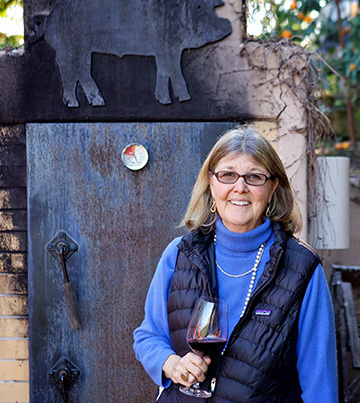 I came to Napa in 1975, just out of college, and began working immediately in the Napa Valley wine industry with my husband, Herb. I worked both for the State of California, weighing and counting grapes for their annual report, and for Napa County as a wine grape ag inspector, testing sugar and looking for MOG at local wineries during crush from the late 1970s to the mid-1980s. Our winemaker, Michael Trujillo, has always impressed me with his growth from Colorado farm boy to cellar rat, to assistant winemaker, to winemaker then CEO of Sequoia Grove. Trying to make a living from less than 1,000 cases of wine! Our dedication to the finest possible fruit; from protecting the Ag Preserve to maintaining the land that allows us to farm, to the research into rootstock and clones, pests and disease, technology in the vineyard and excellence and experimentation in the winery. We are always reaching out to achieve higher goals and share our findings with each other. I would love to live to be able to introduce my wines to my grandchildren and tell them my story; hopefully there will be three of them! Just do it! Today there are so many possibilities with a little education, experience and a lot of passion. I have seen people with no prior experience become successful winemakers, creating a delicious array of wines, merely because of their passion and drive, making connections and learning from their peers. Make the commitment and find your niche, and you, too, will be a part of this amazing wine community. Raised in Pasadena, with no agricultural background per se, I went to Cal Poly San Luis Obispo as an Ag Science major, raised hogs and farmed row crops. There I met the Aggie of my dreams, who took me home to his sleepy community of Napa Valley to start a life in agriculture.